Qur'an is the Holy book of Muslim/Islamic peoples. On the Internet, some sites offers to read the Quran online. If you do not have internet connection, you can’t enjoy reading the Qur'an in your computer. Recently I found one project when surfing internet that is software for Quran Reading and Researching. Zekr is an open source, cross-platform software to read/study/research and learn the Holy Qur'an. Basically it is started as a Qur'an Project and after that it is designed with very well interface. 1. Read and Search through Suras and Ayas and pages. Advanced search and Navigation are also available to find the particular one. 2. Bookmark your favorite verses and Ayas and manage your bookmarks. 3. Multi-language Translations for Qur'an available for many languages. 4. Multilingual User Interface - Use this software with your language completely. 5. Recitation and commentary supported. You can listen Ayas one by one with Audio feature. 6. You can customize the fonts and themes and Interface suitable to you. 7. This is open source software you can also contribute this project. 8. This software available for Windows, Linux and Mac computers. This software includes Arabic and English Language translations only. If you want to add your language translations, Click here to get translations for Quran. Download your language files and go to Tools menu->Add-> Translation. Select your downloaded language file, you will see Quran in your language. You can set view mode to see only Quran , translations, Mixed and Multi-translations. Mixed mode is best for see Arabic and your language translation. If you want to see more than two languages, you will use Multi-translations. Go to View Menu-> Layout-> Select whatever you want. You can view and use this software with your language completely. If you are a French , you can use this software with French language menus/commands. 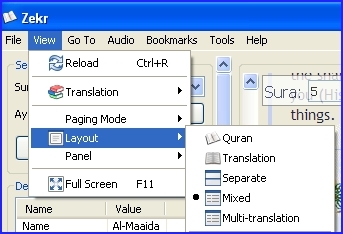 Let’s see how to use Quran software in Tamil language. Go to Tools Menu-> Options. In the language box, select your own language and enjoy.